After the completion of the head-to-toe assessment, (See our other article titled, “Assessment of Survivors of Natural Disasters with Non-Life-Threatening Injuries”) the rescuer should begin administering first aid to individuals according to the assessment findings and in alignment to the training they have. CERT trained members receive instruction in the treatment of all the injuries or conditions discovered during the head-to-toe check. During the assessment process when injuries are identified, the rescuer is to document, mentally and later in written format, the injuries that need to be attended to once the assessment is completed. 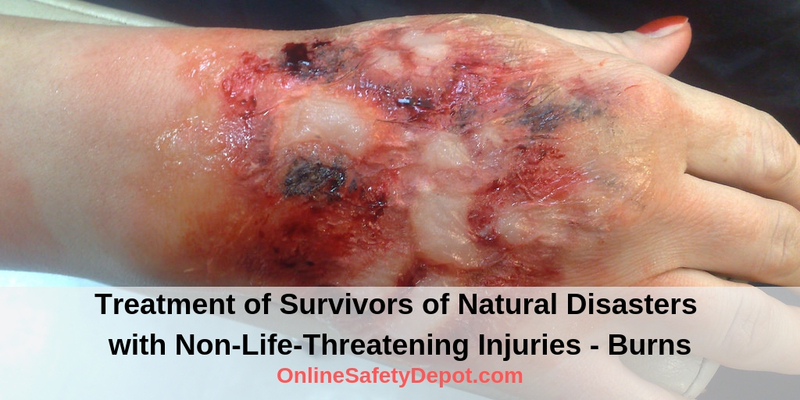 These non-life-threatening injuries include burns, wounds, contusions, sprains, fractures, joint dislocations, hypothermia, dehydration, etc. In this article we will focus on the classification and treatment of burns. The specific “classification” of a burn is determined by how many of the skin’s layers were damaged in the burn. Skin has three layers, the outer epidermis layer rich in free nerve endings, the dermis or middle layer containing blood vessels, sweat and oil glands, and the innermost layer called the subcutaneous layer which also contains vessels, fat, muscle and bone. Superficial Burn: Burn affects only the outer epidermis layer of the skin and is characterized by redness, dryness, pain, and possible swelling. Partial Thickness Burn: Burns through the epidermis into the underlying dermis. This classification of burn is characterized by redness, blistered skin, weeping skin that appears wet, pain and possible swelling. Full Thickness Burn: This burn is so severe that it destroys both the epidermis and dermis and burns into the subcutaneous layer possibly damaging muscle, bone, or other tissues. This burn may appear white and leathery or charred black and will be without moisture as the blood vessels have been destroyed. In a true full thickness burn there is no pain as the nerve endings have been completely destroyed. However, the pain that the victim is experiencing is from the surrounding partial and superficial burns. Remove the victim from the burn source and remove any smoldering clothing unless it has been burned into the victim’s skin. If this is the case the clothing should be cut away around that which is embedded into the skin. You should also remove any metal objects such as watches, necklaces, bracelets, etc. Immerse the burn body part in cool water or place under a tap of cool running water. This is best used when the distal ends of extremities are the burned parts. Apply cool compresses (towels, sheets, clothing) to burned areas. Ice is not recommended. As the cool temperature warms overtime you will need to submerge in cool water again and reapply. Do not apply ointments, creams, etc. to the burn as it can help trap warmth in the wound and will need to be removed during the official cleaning of the wound in the hospital setting. In burns that cover large areas of the body and where the protective layer of skin has been lost in the burn, you need to take precaution to not over cool the victim and possibly lead to hypothermia. A general guideline is to be cautious of burns covering greater than 15% of the body surface area and very cautious with infants and older persons. When the burn has been properly cooled, it should be covered loosely with sterile dressings to help prevent against infection. Mostly, dry dressings are recommended. When the burn is to an extremity the burned limb should be elevated above heart level. In the case of a chemical burn where large amounts of chemical is still on the skin, it should be initially swept away. After the bulk of the chemical has been swept off the victim’s skin the remaining chemical should be irrigated away with cool water. In the case of an electrical burn, you should be aware that there can be significant internal burns if an electrical current passed through the body from its entrance to another body part before exiting. Because of the power of an electrical current it is also possible that there could be damage to bone and muscle. In the case of severe burns, you should monitor and treat for signs and symptoms of shock. Burns can be very traumatic to the victim. Those providing rescue and intervention treatment to burn victims should be sensitive to the emotional and psychological impact that can accompany burns. A calm and reassuring voice and interaction with victims can help them and you to more effectively deal with the initial trauma allowing for a potentially better long-term outcome for the victim.